These delicious, flavourful. 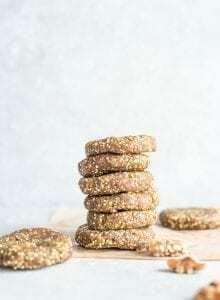 soft but crunchy cookies are made from superfood ingredients like dates, walnuts and hemp seeds. They make a delicious dessert or healthy snack any time. Or try them crumbled over smoothie bowls or banana nice cream. Add all of the ingredients to a food processor and mix until it forms a thick dough. Pulse in the toasted millet if you’re using. Roll the dough into 16 equal sized balls, then shape the balls into cookies. Place in the freezer for 2 hours then enjoy. Store in the freezer or fridge. They’re amazing straight from the freezer so I’d recommend storing them there. You can either shape the dough into cookies, roll in into balls or press into a parchment paper-lined baking pan and then lift out and cut into energy bars. Nuts and seeds can be mix and matched up to 2 cups total.